A trio of scoundrels hijacks a very special ship containing examples of most land animals, but the ship belongs to Aquaman. This is a massively cool story for one big reason. This is the first appearance of any civilization that lives under the sea. And what civilization, you ask? Atlantis, complete with a dome. That's right, the undersea domed city of Atlantis first appears in this Golden Age tale, complete with a retelling of the sinking! The Atlanteans in this tale are survivors of the disaster rescued by Milo, an Atlantean who warned of the impending doom but was ignored and made fun of (hmmm, sounds familiar somehow). Milo created a giant bell jar outside of town and when the disaster hit he got as many as he could save ("only a few") into it. The colony thrived, and centuries later Aquaman finds it. He's able to communicate with the people because he "learned several languages during my travels," but tells them "You do speak peculiarly". Heh. What these Atlanteans want most is to see what sort of creatures live in the world above. So Aquaman takes three Atlanteans, a boat, and gathers up a huge zoo of animal life so they can see the animals for themselves. In the middle of a war. There is a page of Aquaman easily capturing animals while the hapless Atlanteans look on. 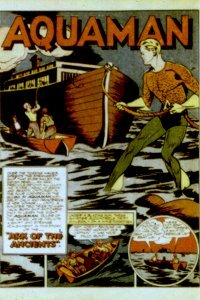 When the task is finished, Aquaman leaves the ship to do a patrol, leaving the Atlanteans to sail home by themselves. Which is when the hijackers come in. The three hijackers are adrift in a row boat because they mutinied against their captain. They are quite delighted to find the ark, and even more happy to discover it's only guarded by three peaceful Atlanteans, whom they promptly throw overboard. The hijackers have apt but silly names. Runt is short. Pegleg has a pegleg. And Vulture looks a bit like that bird. This story doesn't exactly contradict Aquaman's origin. His father could still have discovered the ruins of the city, since the bell jar Atlantis was not on the exact same location as the original Atlantis. But that inspires the question of why, if Aquaman's father could use the knowledge of the Atlanteans to give Aquaman the power to live undersea, couldn't Milo have given his people the same abilities, allowing them to become a race of people at one with the sea? Captured/Knocked Out report: Pegleg uses his crutch to knock Aquaman out. Finny Friends Report: When Aquaman is tightly bound and tossed into the water, a shark attacks him. He bites it by the tail to keep it from eating him. When he escapes, he gets a sawfish to cut his bonds. Then he uses a whale to stop the ship and pull it to Atlantis.